Installing SharePoint 2013 Apps programmatically: what’s possible, what not? 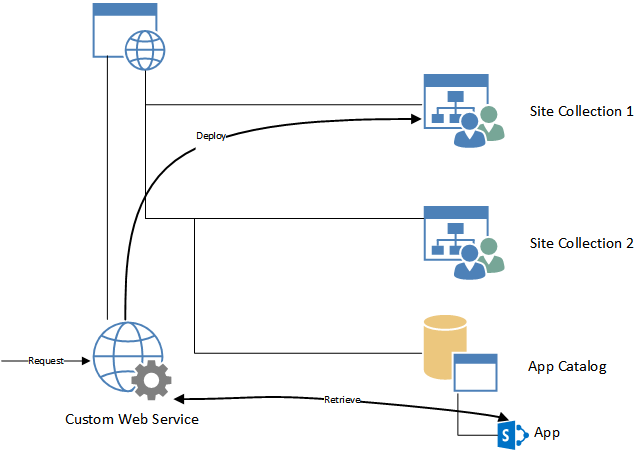 Last week I was looking for a solution to install SharePoint Apps using Server Side Object Model (SSOM) or Client Side Object Model (CSOM). Microsoft does not really support this scenario as it is not the preferred ways to use Apps. Normally end users should install Apps themselves on sites they want. In this post I will cover the possibilities of provisioning Apps using code. But I investigated the API to see if there is a way to support the sample scenario somehow. Now we know what we want we can look into the API which is present in SharePoint and see what possibilities we have. Microsoft offers not much API’s for provisioning Apps. When browsing on the internet you will probably find a method called LoadAndInstallApp on the SPWeb object. This method however only accepts stream object to a binary representation of the .app file. The .app file is actually a zip file containing the application. The disadvantage of this solution is that you have to upload the App to every single Web where you want to deploy this App and not using the advantage of a central location like the App Catalog to distribute the Apps and taking care of versioning. A sample of how to install apps using SSOM can be found on MSDN Blogs. When digging further in the SharePoint DLL’s using ILSpy you will notice that there is no publicly available API to install Apps directly from the App Catalog. Internally there are some methods available, as it is possible from UI to add an app from a Corporate Catalog on a Web. A possible workaround is to retrieve the App file from the App Catalog (it is internally just a list) and then forward the stream object to the LoadAndInstallApp method. This works however SharePoint doesn’t notice then that the App is coming from the Corporate Catalog. In case a new version of the App is installed on the App Catalog, SharePoint doesn’t know that the App which is installed on that specific Web is updated and can’t notify the site owner by a notification that an update is available (SharePoint won’t push new versions automatically!). Another thing which you’ll notice is that when opening the Site Contents page and open the context menu on the installed App that the About option is missing. This page is very important, as this page normally allows an end-user to update the App and see if an update is available. So this means that the end-user can’t update the App properly from UI. Conclusion:The API is not that mature to use it in a professional environment to support scenario’s like this. We need to hope that Microsoft will come with an API to support scenario’s like this in future. Currently it seems not to be possible to programmatically install an App from the App Catalog into a Web. This entry was posted in Apps, SharePoint and tagged Apps, CAM, CSOM, SSOM on 15 July 2014 by captain007.